Food and cooking are tricky topics to cover well, as they rely so much on all the senses, while podcasts are exclusively audio. However, some podcasts rise to this challenge with flair and style! Here are the crème de la crème of food podcasts. The icing on the cooking show cake. The perfect lamination on your Great British Bake Off bake. Turn your earphones on and let these shows prove for 20 minutes. Burp as needed. This is one of the longest-running podcasts, initially established alongside the public radio program in the 1980s. Running for almost an hour, this show brilliantly works around the limitations of audio as a channel for food related content, providing creative, engaging visual imagery. The podcast both encourages people to explore around traditional dishes and engage with cuisine they may not have considered before, making concepts such as indigenous Native American cooking relevant to a broad audience. The Splendid Table backs up the podcast with an informative, concise blog, which includes an easy-to-search recipe guides. The whole Splendid Table package is well-designed to effectively target slightly different demographics through each of the different media employed. Good For: Sundays, dinner party planning, long commutes. Lasting an average of 30mins, these in-depth, informative podcasts discuss food in a wider concept, focusing on current affairs that relate to the food we eat, and the way we consume it. The podcast effectively discusses issues, including potentially controversial topics such as the eating of horse meat, with an impartial hearing given to each side, and criticisms focused on legitimate objections and concerns rather than emotional reactions – a refreshing change in an increasingly polarised digital world. Good For: Lunch time listening, research. A social-media focused offering from the Food52 brand, which presents an attractive new offering: engaging younger audiences who may not be interested in cooking but can get behind a discussion on why there’s no pie emoji. Fun, friendly, and a little off the wall, with a refreshing and intriguing new angle and approach. The Food52 blog is clear and concise, with easy to search recipe listings. Good For: Background listening, chillaxing, social media sharing. Another social-media focused podcast, The Baking Podcast features a lot more chit-chat, which may be off-putting to some listeners, while others may find it helps them get into the topic, if food and cooking aren’t an established interest of theirs. While some of the podcasts on The Baking Podcast include information on where the “introductory chit-chat” ends, not all do: extending this to all podcasts would make The Baking Podcast easier to engage with. Good For: Relaxing evenings with friends, parties, social media sharing. This podcast takes the interesting approach of focusing on a single foodstuff, both firm favorites and rising star products which are gaining an increasing following. This is a very lively, energetically presented podcast, and is probably more suited to a younger audience. However, the informal yet focused nature of the podcast makes it a good way for young adults, particularly, to encounter and explore new foods, and develop a broad range of tastes and preferences. Good For: Millennials on their own for the first time, people new to cooking from scratch, relaxed evenings in with friends. No discussion of food podcasts would be complete without a reference to the funniest podcast in the history of mankind. Check out our full review here. 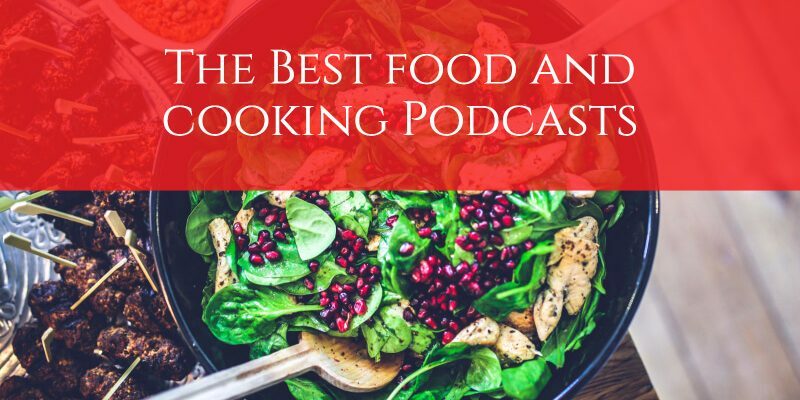 Food is a difficult topic to cover well with just audio, but, with a creative approach, and a commitment to “doing different”, a food podcast can be successful and engaging, particularly when backed up by a more in-depth blog.